Back around Christmas time I saw on TV that the chain restaurant Denny’s was serving Gingerbread French toast. I thought that sounded delicious and decided we needed to try making it ourselves. Unfortunately we didn’t have time to try making them before Christmas. But while gingerbread men are a traditional Christmas cookie, just plain gingerbread is more of just a general wintertime treat, so there’s still time to make gingerbread French toast! 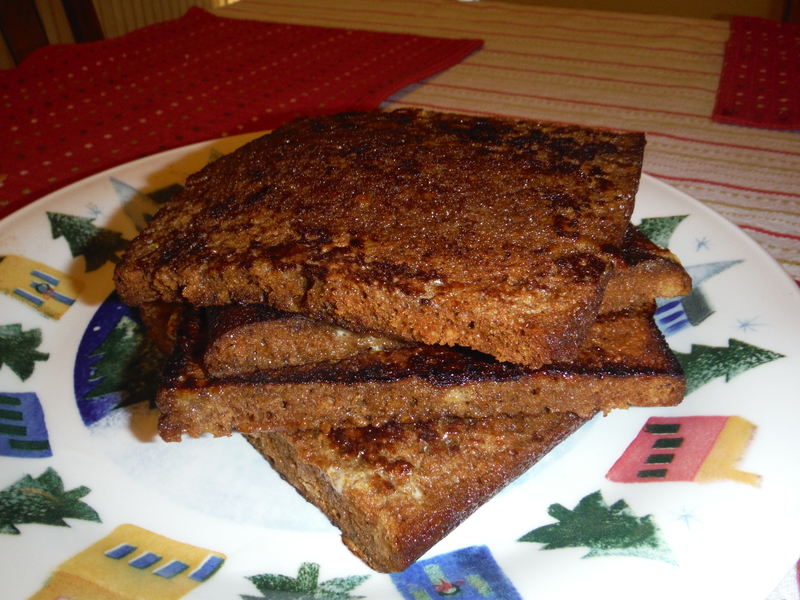 Some basic research revealed a plethora of recipes calling themselves gingerbread French toast. I feared we were too late to jump on the gingerbread French toast bandwagon. However, upon closer inspection we realized most of these recipes didn’t actually use gingerbread! They just used regular bread and added gingerbread spices to it (or were weird things that didn’t even look like French toast, but that’s another story). But where’s the fun in that? 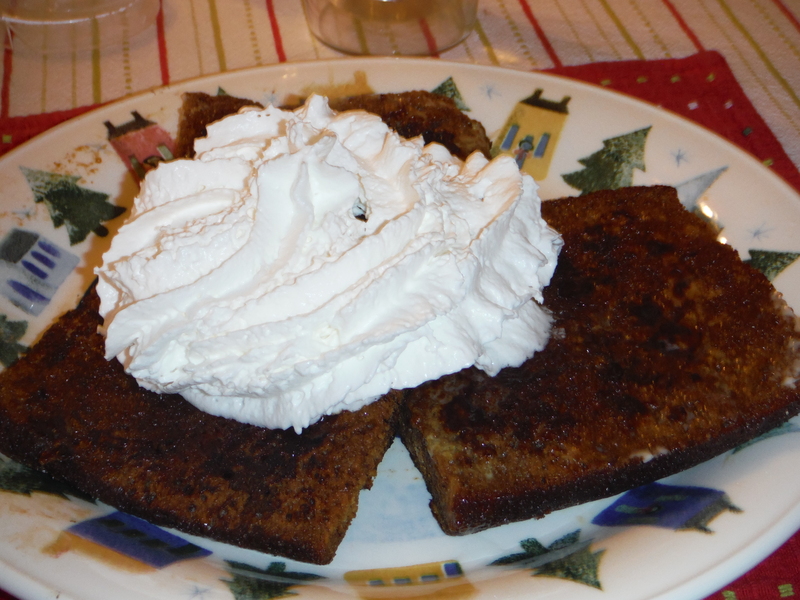 So yes, we used real gingerbread for our gingerbread French toast. While this may seem like a bit of a no-brainer, it’s important to note that we used gingerbread that was in loaf form, and therefore easy to cut into slices for French toast. 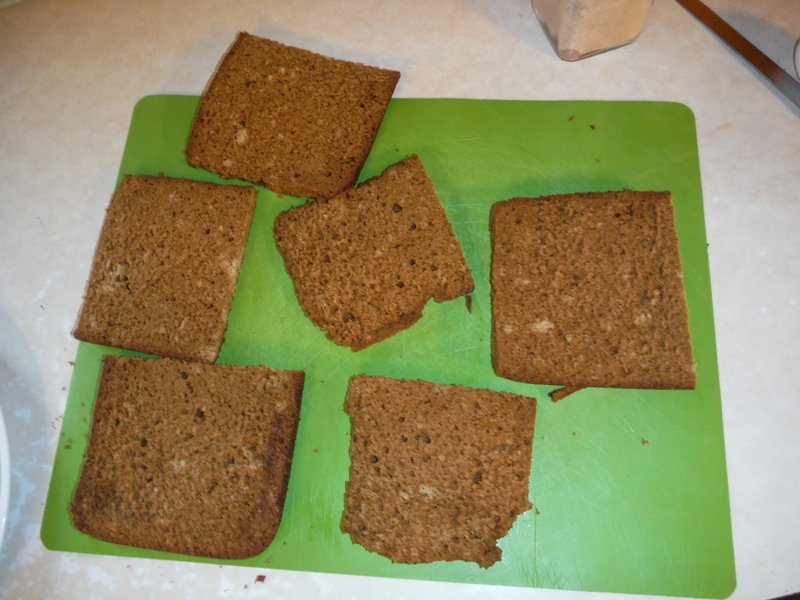 Using gingerbread in cake form would probably not go very well, since it’d be hard to get slices that mimic sliced bread. Basically this is just standard French toast procedure but using slices of gingerbread instead of other types of bread. The main difference between this and our Simple French Toast recipe is that we decided to mix the egg and milk together to make a custard since we weren’t sure if the more moist, crumbly gingerbread would hold up well to double dipping. In a shallow bowl, carefully whisk together the milk, eggs, vanilla and sugar. Thoroughly lubricate your cooking surface. Even if you’re cooking on a non-stick skillet, you’ll probably want to spray it, since this is going to be rather sticky. The gingerbread has way more sugar in it than regular bread and you’re also adding more sugar to it while cooking. Once your skillet is hot, you’re ready to cook. How many slices you cook at once depends greatly on the size of your skillet. Right before cooking, dip the slices of gingerbread in the egg and milk mixture. Do this quickly, but make sure both sides are coated. Then place on the skillet. Sprinkle the top with cinnamon sugar. Once bottom starts to brown, flip and sprinkle the other side with cinnamon sugar and cook. Flip one more time to caramelize the sugar, and then remove from skillet. While you could eat this with syrup, since gingerbread already has so much of its own flavors we recommend enjoying your gingerbread French toast with either powdered sugar, whipped cream, or even simple icing. Posted on January 22, 2015, in We Can Do It Better and tagged breakfast, Christmas, cinnamon, crazy crossovers, Delicious, french toast, recipes. Bookmark the permalink. Leave a comment.